2014 January | Time to Cook! I had been in search of the perfect Chicken Tortilla Soup recipe for a while, so was so excited when my mother-in-law Patsy told me about this one that she found. It’s straightforward but is a little time consuming, so I would call this a “weekend” or “special occasion” soup – not one I’d whip up all the time during the week. It’s a hit with kids and always fun for people to add their own toppings. This is the perfect soup to keep you warm during the cold winter months. Enjoy! Recipe slightly adapted from the one on food site Chow.com, which was adapted from the Neiman Marcus Cookbook. “There are a lot of ingredients in this soup, but each one plays a part in its big flavor. To make it, first soften vegetables including onion, carrot, and bell pepper in a pot, then add dry spices to bring out their flavors. Add chicken broth, tomatoes, and tortillas, then let the mixture simmer until everything melds and the tortillas disintegrate to make a thick and hearty soup. Finally, throw in shredded chicken and garnish with fried tortilla strips, or if you want to skip frying the strips, just use regular crushed-up tortilla chips. Heat the oil in a large saucepan or Dutch oven over medium heat until shimmering. Add the onion, carrot, celery, and bell pepper and season with salt and pepper. Cook, stirring occasionally, until the vegetables have softened, about 6 minutes. Add the garlic, chili powder, coriander, cumin, oregano, paprika, and cayenne and cook, stirring occasionally, until fragrant, about 2 minutes. Add the broth, water, tomatoes, and measured salt and pepper, stir to combine, and bring to a boil. Reduce the heat to low, add the tortillas, and stir to combine. Simmer, stirring occasionally, until the tortillas have disintegrated and the soup has thickened, about 1 hour. Meanwhile, make the tortilla strips. Heat the oil in a large frying pan over medium-high heat until shimmering but not smoking (about 350°F on a deep-frying/candy thermometer), about 6 minutes. Meanwhile, stack the tortillas on a cutting board. Cut the stack in half, then cut crosswise into 1/4-inch strips; set aside. Line a baking sheet with paper towels; set aside. When the oil is ready, add a handful of the tortilla strips and fry, stirring occasionally, until golden brown and crisp, about 2 to 2 1/2 minutes. Remove with a slotted spoon to the prepared baking sheet and season with salt and pepper. Repeat with the remaining tortilla strips; set aside. When the soup is ready, add the chicken and cream and stir to combine. Simmer until the flavors meld, about 15 minutes. Taste and season with salt and pepper as needed. 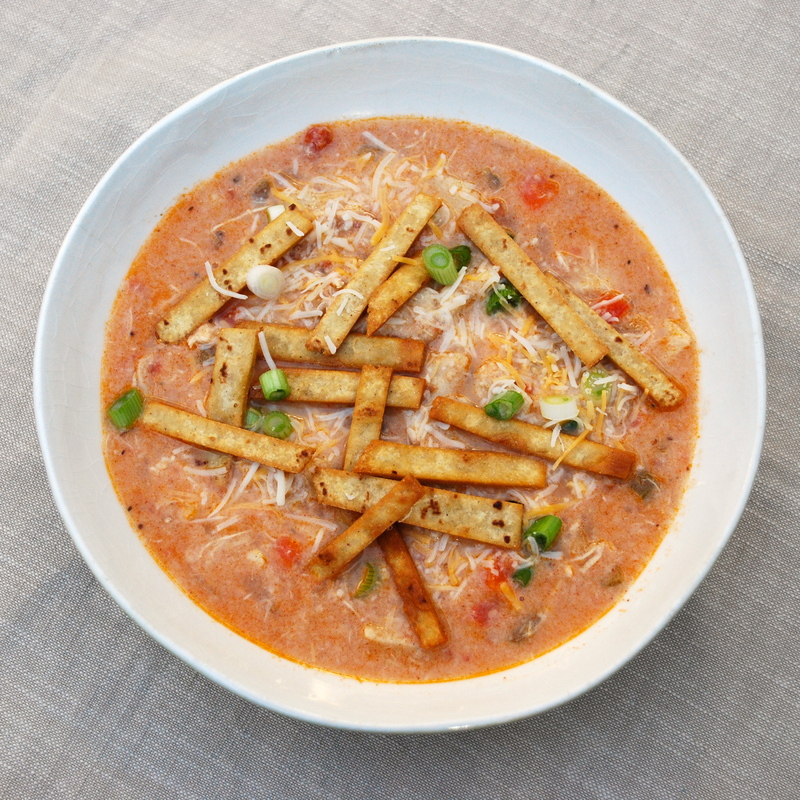 Serve the soup topped with the tortilla strips, passing any desired garnishes on the side. 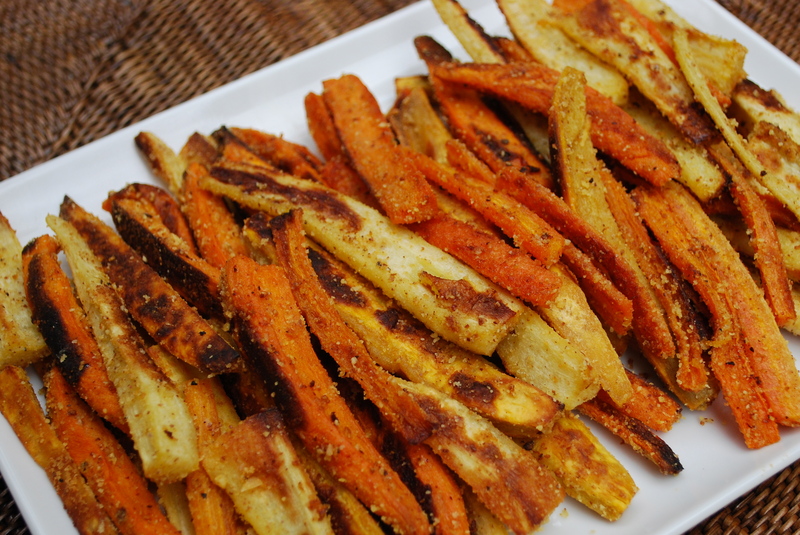 I love this veggie — it’s healthy and tasty (almond coating adds a nutty taste to the vegetables) and each bite offers a different flavor: carrot, parsnip or sweet potato. Note: you can grind the almonds in a mini prep processor or I have an extra coffee grinder that I dedicate to grinding nuts and spices only. I double this recipe (you’re going to want more!) and roast on two baking sheets (you don’t want to crowd the veggies). Pre-heat oven to 400 degrees. In a large bowl, mix together the ground almonds, oil, 1/2 teaspoon salt and some pepper. Toss the vegetables in the mix and then spread them out on a baking sheet in a single layer. Bake for 30 minutes or until crisp, shaking the sheet halfway through.